The bedroom is one of the main premises in the house. That's why the situation in this room must be approached very seriously. It should be comfortable and give comfort, facilitate rest, relaxation and peace. 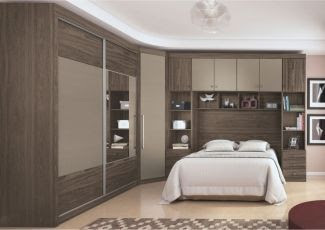 Therefore, it is very important to choose the right bedroom furniture, especially small bedroom furniture sets. 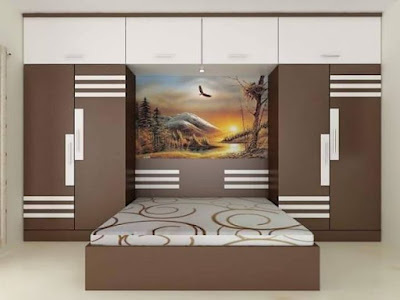 In this article, we will take about built-in bedroom furniture design, overbed wardrobe design, bed and wardrobe design and bed with wardrobe for a bedroom. 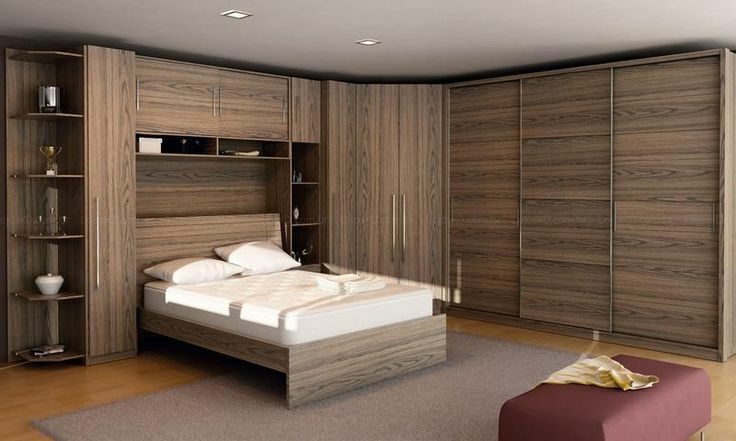 We recently shared an article on modern bedroom furniture design ideas and sets. Built-In Bedroom Furniture Design - Over bed wardrobe. 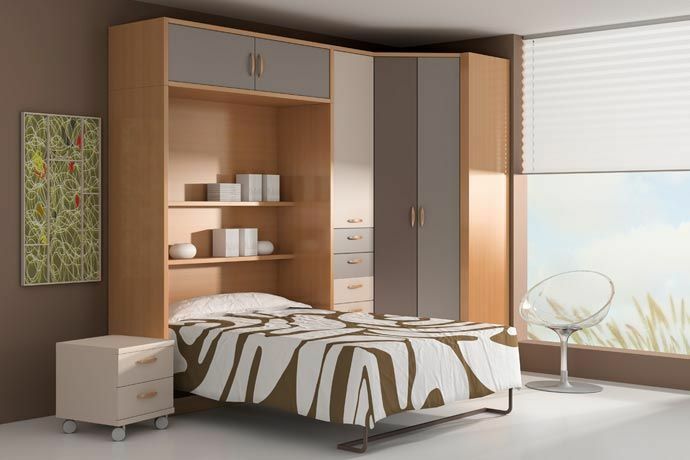 Thinking about the design of your room, you can flip through the catalogs for hours or go shopping choosing models of beds, cabinets, tables. 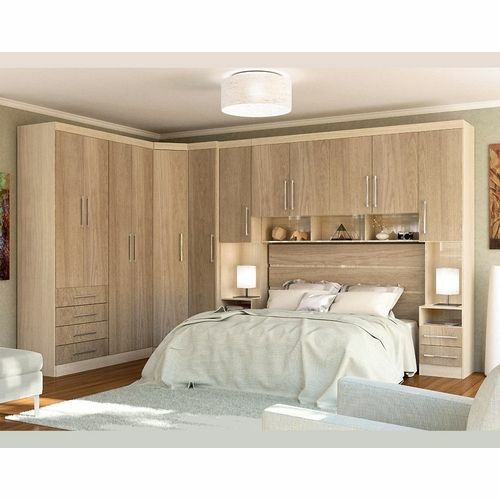 To date, especially popular is the built-in bedroom furniture design that combines an interesting design and space saving. 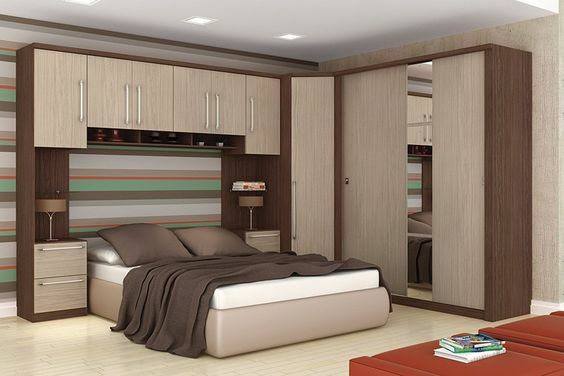 Having decided to install the built-in furniture, your room immediately acquires a different appearance. 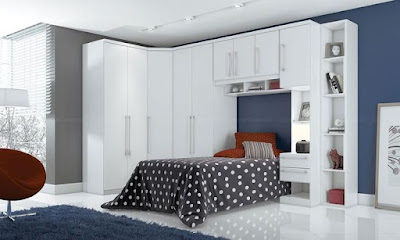 For example, furniture with a built-in bed for a nursery will not only look nice but also during the child's growing up with friends will give children more space for games, due to the compact folding. Fashionable now, the over-bed wardrobe design help not only to place all the things on the shelves, but also it is most useful to use the available space, visually increasing it due to mirrors and possible lighting. 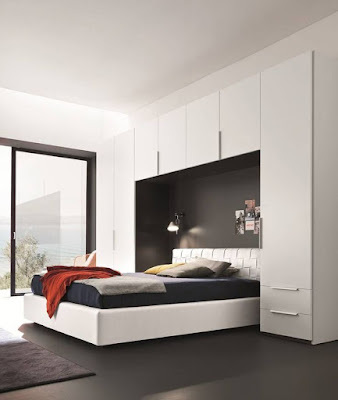 Built-in furniture, a bed such as a closet, or shelves, become, as if part of a room, not sticking out, and not standing like separate objects, they harmoniously fit, creating an atmosphere of coziness and comfort. 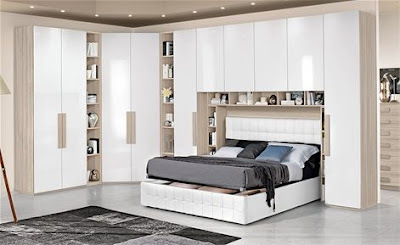 In order to create a cozy home, it is not necessary to pursue modern models, fabrics or designs, the main thing is to correctly use the available space and built-in bedroom furniture design will be an excellent assistant in this. Don't miss one of the most popular catalogs on 3Dex arts, It's Latest modern bed designs for 2019. For an arrangement of spacious rooms, traditional options are used with a closet and a double bed. In a bedroom with a minimum size, it is difficult to accommodate a bulky headset so the best design decision will be furniture made by individual order. If the room has a spacious architectural niche, it can be used to create a roomy wardrobe. 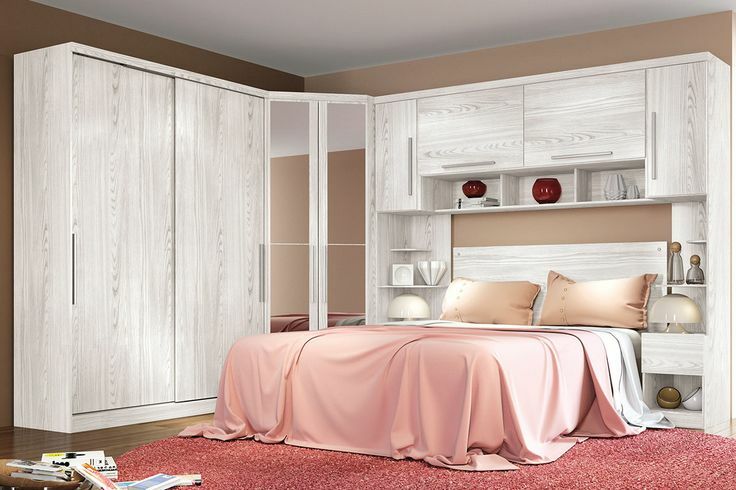 built-in bedroom furniture design is closed with comfortable sliding doors, decorated with spectacular mirror inserts, allowing you to visually enlarge a small space. The glass facade of the bed and wardrobe design compartment can be decorated with sandblasting, label technique or bright stained glass pattern. A rationally designed storage system allows you to give up excess furniture, store personal things, shoes, bed linens and towels in the closet. In modern apartments studios, most often, there is no separate bedroom so the best solution will be a built-in bed. A spacious bed can be arranged in a niche or closet. Thanks to the convenient mechanism, the mobile bed can be quickly and easily deployed. Correctly installed sources of lighting will help create the most comfortable atmosphere. 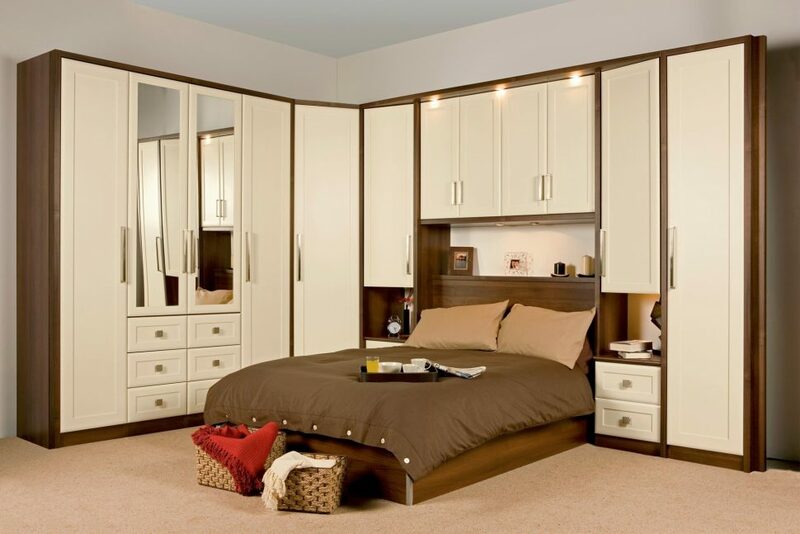 We have collected several design options that can help with the over-bed wardrobe design. The easiest way is to put the mobile hanger in the room. This option is perfect for those who do not have so many things. Under the hanger, you can place shoes, and hang handbags around the edges of the hanger. If there are many things and you really want such a hanger - okay! Off-season clothes can be stored in a closet, and everyday things - on a hanger. By the way, this option is often used by people working in the field of fashion and beauty as it preserves a certain spirit of the fashion industry. 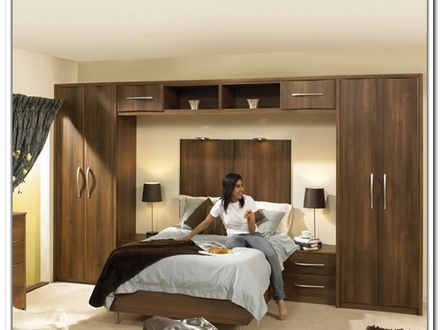 The placement of the wardrobe in the bedroom can be a niche, which can be placed along the longest wall. It can be made of plasterboard or other material with an integrated wardrobe system. Can be covered with curtains or sliding doors. 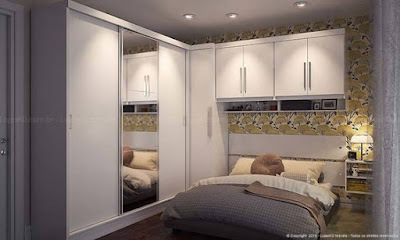 If there is not enough space, you can install an open wardrobe system and equip it with a set of shelves, hangers, drawers, and shelving for shoes. 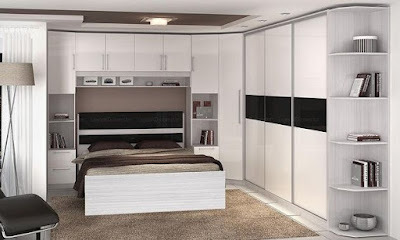 This will be the best solution for a bedroom interior, in which there is a small area. Also here you can install an ottoman, chair or mirror. But there is a drawback - you will have to constantly monitor the cleanliness and order. Another popular catalog we recommend you to explore it: wooden wardrobe designs for modern bedroom interiors. 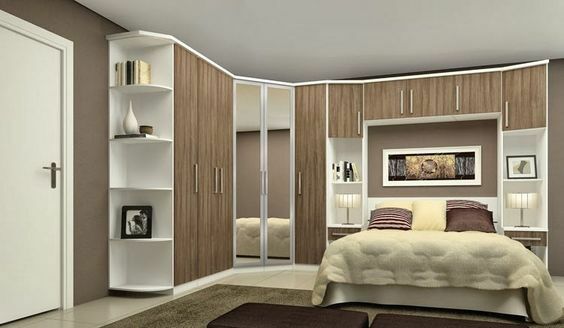 During the design of the bedroom design with a wardrobe, you need to take into account many details: the size of the room, the materials used, the stylistic decision, the filling, and lighting. 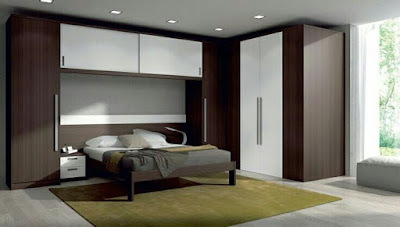 In one corner of the room, you can arrange a corner wardrobe so that the back of the bed rests against one of its walls. To do this, the bed is installed diagonally, due to this the corner is freed - the perfect space saving! For a wardrobe in a small bedroom, a mini-wardrobe option is suitable, in which only the most necessary things will be placed. 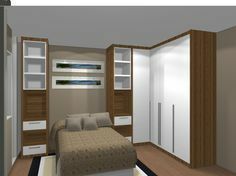 The design of the dressing room in the interior of a small bedroom should coincide with the overall design of the room. 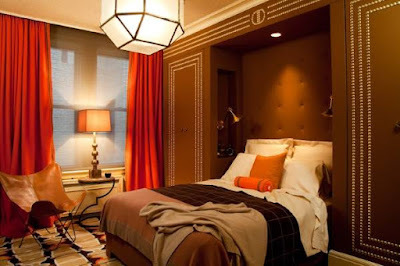 This also applies to the color scheme and texture of the furniture. Finally, there is a collection of photos to choose your style, keep waiting for our next reviews.